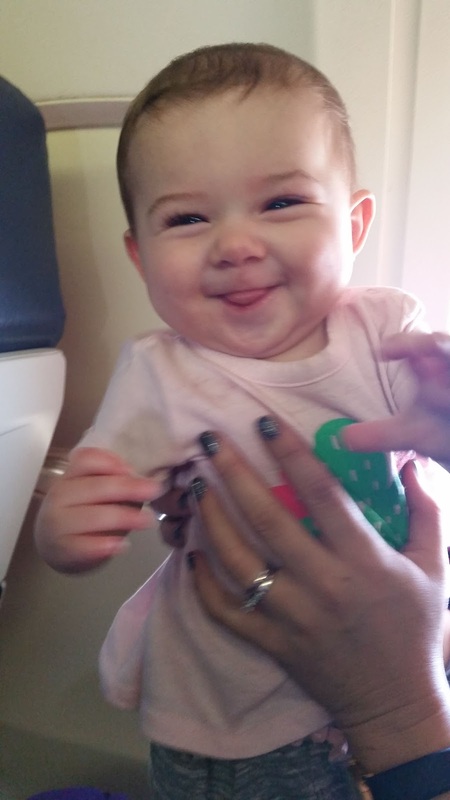 DEBORAH CROMBIE: This weekend my daughter and I took my six-month old granddaughter on her first plane flight. 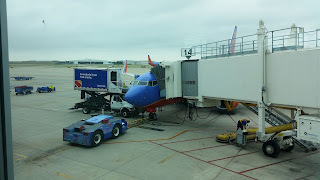 We went to Kansas City to visit my oldest childhood friend, and as a nice parallel, my daughter's first flight, at eight months, was to see the same friend, but in Seattle. 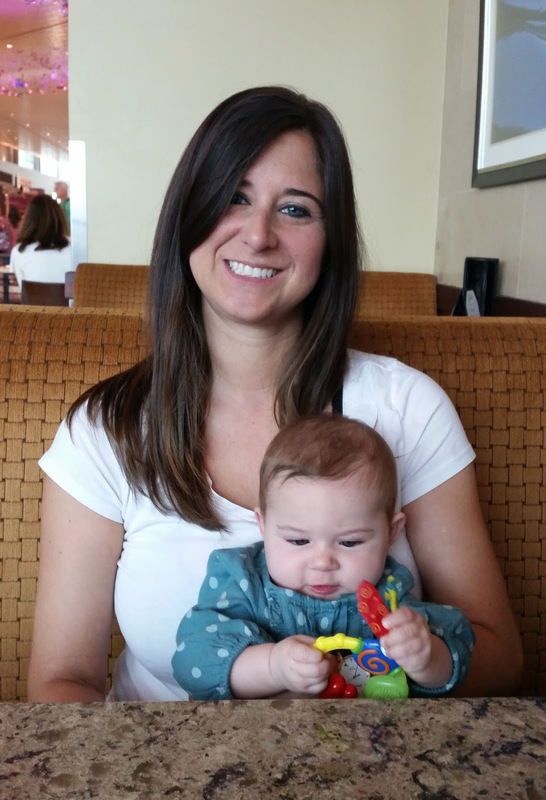 (Now I'm impressed that I tackled a four-hour-each-way flight with an infant on my own!) Here are Kayti and Wren at breakfast at Love Field in Dallas. And here she is landing in Kansas City. So stressful!!! REDS, have you had good experiences flying with children? And what about flying with other people's children? There's a thing going around on the Internet suggesting that parents of infants take goody bags to mollify other passengers, but I think that's a bit much. You shouldn't have to apologize for flying with a baby. I always offer to help, especially if mothers are flying alone with infants and toddlers. A little good will does go a long way, however. What do you think about the goody bags for other passengers? A fun idea or not? SUSAN ELIA MACNEAL: I never even thought of goody bags.... Yes, it's hard to travel with a baby/todder, especially when they are sleep-deprived, which seems unavoidable sometimes with travel. But most of my memories are really good, with lovely people stopping to smile and flight attendants giving us special attention (and handing out plastic pilot "wings" and letting Kiddo see the cockpit —after landing, of course). 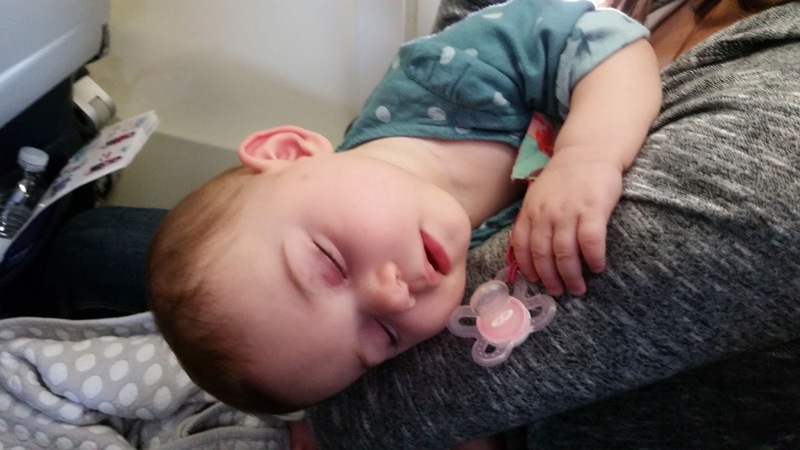 I remember being held on the tarmac at one point, when Kiddo was about 18 months, and he just screamed and screamed — yes, he was "that baby" — and I remember smiling sheepishly and trying to apologize to those around us. And a woman, a nun, I believe, said, "Well, he's just doing what we all wish we could do. Good for him!" RHYS BOWEN: I used to be an expert at flying with children. When my four were small I took them to England at least once a year. John was with an airline and we also took them to New Zealand and other parts of the world. Goody bag were a godsend. I made one for each child. Inside were small wrapped gifts and they could open one every half hour. Age appropriate things--crayons and small coloring book, beads to thread, a puzzle, sewing kits, cards, a small book--oh and candy surprises too. They played, they traded. I don't remember any of them acting up on a plane. and I feel so sorry for kids who are just expected to sit there or stare at an iPad for ten hours. Actually Dominic did have a melt-down once. But that was when we were off-loaded in New York (always traveled standby on a staff ticket) and had to wait a day and a half to get out. Poor kid was eight months old. I ran out of diapers for him. He wasn't on much solid food but had just stopped nursing. He couldn't sleep in a motel bed and he just lost it. I finally was boarded to first class with a screaming infant. The first thing the flight attendant did was to press a glass of champagne into my hand. The engines started and Dominic fell asleep. Bliss. We traveled with babies a lot, and most of the time they were fine. It's so much easier now if you have a computer or iPad to entertain them. We went to Guadaloupe when Naomi, my #2, was almost two. The flight home was delayed, a lot (six hours as I recall). And we were all wiped out when we finally arrived at Logan. Bleary-eyed, we waited for our luggage to show up and somehow missed the fact that Naomi had slipped out of her stroller and taken off all her clothes. We noticed when she started streaking, starkers, up and back through baggage claim screaming MY BODY, MY BODY! She did have a delicious little body. JULIA SPENCER-FLEMING: Hallie, I bet you could have, as we like to say, eaten her with a spoon. I've done plenty of traveling with kids and babies over the years. Once they're old enough to play games or read, it's SO much easier. We flew from Boston to Honolulu when the Smithie was 7 and the Sailor was 6. We got them their first-ever Gameboys for the flight, and a bunch of little-kid-suitable games. Easiest long distance flight ever. We kept on using that trick - in our house, the ONLY time you could play an electronic game was while traveling by car or train or plane. Ross and I flew from Portland to Cancun with three-month-old Baby Smithie. I know, it was insane, but my father-in-law had a fantastic condo on the beach, and once we got there, we had built-in babysitting. Emphasis on ONCE we got there. We were delayed in Boston, rerouted through Charlotte, and had to wait in the terminal for what felt like hours. Baby Smithie got more and more agitated until we finally sat down in our seats, which was her cue to start wailing. We passed her back and forth, I nursed her, we swaddle wrapped her, change her diaper - everything that was in our meager new-parents arsenal. HANK PHILLIPPI RYAN: So you have heard about, right, the fabulous Jet Blue (I think it was) solution to the baby dilemma? As I heard the story, on one particularly crowded airplane, the flight attendant announced over the PA system something like: We have a lot of babies on this flight. But here's the deal: If four babies cry on this flight, Jet Blue will give every passenger a free ticket anywhere we fly. So of course, every time a baby cried, people were thrilled and delighted. If have no idea of the rest of the story. But I love it! It's all about perception. Oh--one more hilarious thing. I was on a Southwest flight once--you know how their pre-flight announcements are sometimes funny--and this flight attendant got to the part about the oxygen. He said: "In case of a loss in pressure, oxygen masks will drop from above. First, stop screaming. Then, put the mask over your nose and mouth, and breathe normally. If you are traveling with small children: what were you THINKING? But anyway. cover your own nose and mouth first...."
DEBS: Hank, we flew Southwest and they were terrific! LUCY BURDETTE: No, have not flown with children but have taken many long car trips with our kids pre-ipad era where we came close to imploding along the way. The ice and snow storms on the way to Vermont did not lighten the mood. Rhys, I'm so impressed with your planning those bags for four kids! Of course my parents drove across country with four kids and a German shepherd, and took many smaller trips too. My sister and I would read, or else torture the younger two by "distributing" houses as we passed them, giving ourselves all the nice ones and the other kids an occasional shack. My brother finally melted down one day. My mother, "oh for goodness sake girls, will you give him a nice house?" DEBS: I don't think we needed goody bags for the other passengers. 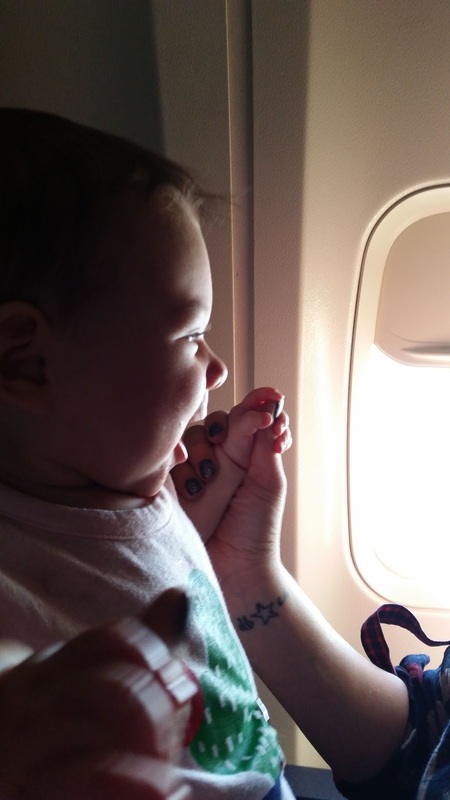 Here's Wren enjoying our descent into Dallas on the return flight. I think this girl is going to be a world-class traveler! Our seatmates were very nice on both flights, and, honestly, the planes are so loud, and so many people are wearing headphones, that you might only want a goody bag for the person next to the baby. 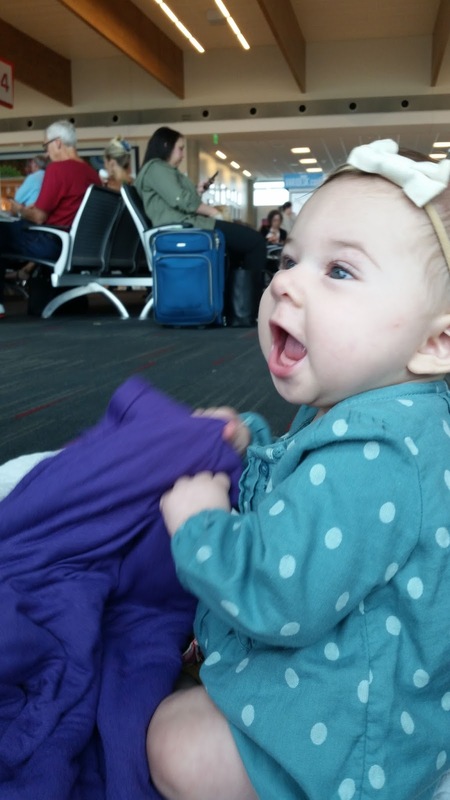 READERS, do you/did you travel with infants? And would you appreciate a goody bag from a traveling parent? I LOVED the pictures of adorable Wren! Thanks for posting them . . . . When the children were small, we flew across the country [from California] every year, usually in April, and we’d have family Christmas when we got to New Jersey, but that’s really another story. Back in those dark ages of flight days, the children could get a deck of cards and the eagerly-anticipated-and-always-worn plastic wings from the flight attendant. And I always packed things [a goody bag of sorts] to keep them busy, including a surprise or two, and a small snack in case of an unexpected delay in the airport or on the tarmac. We never had any problems flying; the children were always well-behaved and got to where we were going in good spirits. Since the same process worked in exactly the same way all the times I flew with my grandchildren when they were small, I guess it was a good travel plan . . . .
Wren looks like such a happy baby! We traveled extensively with our boys from the time they were infants - took older to France at age three months, traveled to Mali with both when younger was eighteen months, plus our families were on the west coast, so we flew coast to coast several times a year. I nursed them for a couple of years each, and nursing during takeoff and landing was key for ear adjustment (later it was the juice box reserved for same purpose). Like others, I packed quiet games and books and let them play on the floor when they needed to. Younger made a hobby of walking to the bathroom over and over and collecting a tiny soap each time (back when soap wasn't liquid). I figured it was exercise! I just got home from Jacksonville Florida where I taught a day long seminar to the Sisters in Crime chapter--which was so terrific! But in the bathroom at the JAX airport, there was a mom and her daughter, two year old Charlotte as I came to learn. Charlotte, in little pink dress and sparkly sandals, was marching up and down the bathroom, saying, in various inflections, "No!" Clearly practicing for different circumstances. It was hilarious--but I felt for that mom! Debs, I'm in love with little Wren. What a sweetheart. Prefect baby pictures! 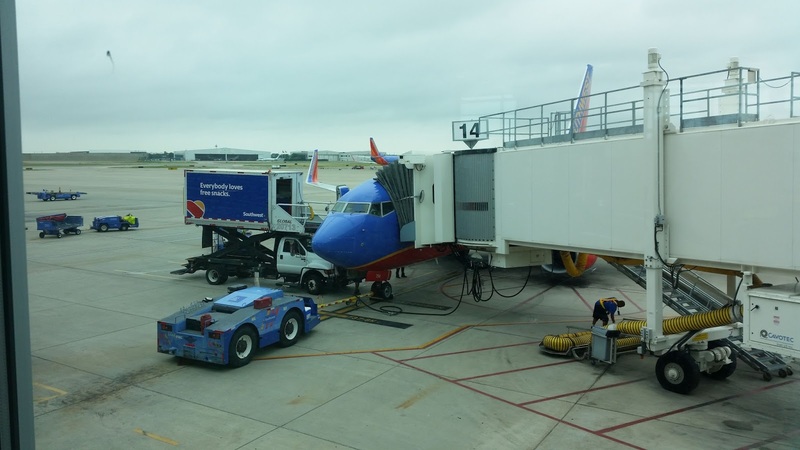 We love Southwest, too. Our last flight into Tucson, the flight attendant was a comedy in short pants when he did a routine juggling and tossing snack packs to each passenger! Hallie, so funny! That little girl wasn't the blogger I enjoyed so much was she? I had a similar, but not quite as freedom expressive event with Alicia in a restaurant. A woman yelled at me, and I yelled back, "My daughter? I thought she was your daughter!" I was prepared for her assault, but her kids–all five–started screaming, and we snuck out. Look, I have been on airplanes with plenty of disruptive and disagreeable adults and have never once been given a goody-bag. Parents have enough to deal with already, so let's not add yet another thing to their list of things to do/pack/remember. Most of the parents I know or have encountered with tired children on flights have been very apologetic. As long as they did what they could, I have no problem with it - flying is not fun of any of us. It's the parents who allow the older children to run up and down the aisle, have the volume on their tablet at 120 decibels, and to continuously kick the back of chairs that really need a lesson in how to raise respectful children. But even then, I blame the "adults." And I'm with Kristopher--no goody-bags for adult passengers. If you think, in advance of a flight, that your child is going to be so bad that you need to pacify your seatmates--then maybe you'd better rethink the whole idea of flying. Goody-bags are for the KIDS--to keep them occupied--keep little hands busy, little tummies full, a favorite comfort toy there for when it all gets to be too much. The only time I get upset about kids flying is, as Kristopher also noted, when there is a decided lack of control/discipline/attention on the part of the parents. I am not, and the flight attendants are not free babysitters! Wonderful pix Deb and I can't help but think what a wonderful traveler she is! I never traveled with children of my own (there's a prerequisite there I don't qualify for :() But in the 1980s when seats were larger I used to travel to the Caribbean every weekend. For most of that time, it meant four flights. Two in, two out. I traveled next to plenty of kids. For the most part, I enjoyed them and since I had a standing order window seat often got lap duty. It was great fun to point stuff out and watch the sheer look of amazement. There was only one bad experience. in the days when you didn't have to buy a ticket for children below a certain age, the couple next to me flat out lied. Their kids were easily 6 and 8 and too big to lap ride. They were also the worst behaved kids I've ever encountered. I couldn't believe the airlines didn't turn them away and make them buy seats, but it was a full flight. Had anything happened...Those kids would have not had a chance. It was a huge risk the parents took to save a couple of bucks. Wren is so adorable. Share away! I flew to Columbia, SC when The Girl was, oh, a year and a half? I was pregnant with The Boy (7 months?) She was so well behaved and completely charmed the Southwest airline staff. I also remember driving to Buffalo in November when The Girl was 4 months old and we had our dog. They closed the NYS Thruway because of snow. There we were - baby and dog - stranded at a Thruway rest stop. THAT was torture because she was tired, we were tired, she was hungry - even the dog was antsy! We followed an 18-wheeler out and took back roads to Buffalo. We didn't travel to Buffalo between Thanksgiving and Christmas for a long time after that. I agree, adults don't need goody bags. I sympathize with most kids because airline travel is wearying. The one time I got annoyed was when I was coming back from Puerto Rico for Christmas (I was 22) and the kid next to me (center seat in the center section of a ginormous plane, after the airline told me my ticket had been canceled, so I was already in a bad mood) WOULD NOT STOP KICKING MY SEAT. And the mother said nothing! I think I was more annoyed with her than her kid. Kristopher, so funny. I was going to mention the seat kicking thing, which absolutely drives me bonkers! Debs - any excuse you can come up with to post pictures of that adorable girl are fine we me. She is precious! When I was almost two years old, we flew from California to Indiana for my sister's baptism. My mother was concerned about flying alone tending a toddler and an infant so she asked the doctor for a little something to calm me down. He gave her a little phenobarbital (he said). Anyway, it had the reverse effect and I took the plane apart as much as a two year old can. I remember it clearly. In those days, the headrests had little cotton cloths pinned to each one to soak up the men's hair oil. I wanted them all. So I ran up and down the aisle trying to take them with a stewardess on my heels. I never tried to fly with kids that little. Just saying. She's too cute! I think expecting the parents to mollify other passengers with gift bags is a bit much; they have enough to organize. I did once mollify a crying neighbor with DumDum suckers my nieces had given me for the flight -- helps with ear pressure. I've thought there should be baby/no baby sections on planes, and I'd gladly sit with the entertaining babies and children. On one flight from Europe, a couple were bringing back two 18-month old boys they were adopting. They couldn't sit together because there was only on extra oxygen mask in a row, but they had willing and eager extra hands whenever they needed. Someone (might have been me) "liberated" a bottle of water for formula from first class, and later begged a diaper off a mom in the ladies room when they couldn't find any to buy in the Detroit airport. If no babies, then I'll just read . . . currently reading NECESSARY AS BLOOD and in love with little Charlotte. Aww, Wren is as sweet as sugar. So fun, to see things through her new eyes, I'm sure! On my way back from Prague in June there was a man and I guess his dad traveling with two young sons. One was content (when I saw them, while waiting in line for the loo) to play with an electronic device, but the younger one was wailing nonstop. The two men were bleary-eyed and not paying any attention to the poor kid, so I starting playing a discreet game of peekaboo with him. The men, sitting four feet from where I was standing, didn't even notice, but another passenger in line, did, and she joined in. We had that kid calmed down in just a few minutes. I think the dad and grandpa were just overwhelmed and tired from not sleeping on the long flight. That was also when Air France pilots were on strike, and all of Europe was a mess from all the canceled flights. My grandson, before he was two, had 50,000 sky miles, almost all of them international. My daughter says the best place in the plane to sit with a child is the bulkhead seat, because there's a protected play area. First off, that Wren is a delight to see pictures of, so please post as many as you like, Debs. She is a true cutie patootie! I so enjoyed all of the stories about flying with children. Susan, the nun hit the nail on the head. Rhys, that was one smart flight attendant. Hallie, Naomi's streaking is hilarious. Julia, good move to let the other passengers off first, and how nice they weren't all grumbling. Hank, Jet Blue may have just given incentive to someone to poke a baby. Lucy, did you ever give your brother a nice house? I didn't fly with my two kids until they were around five, and it was easy to provide goody bags to keep them busy and happy. 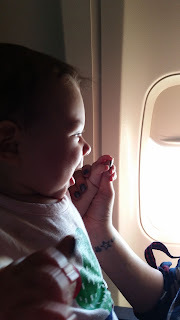 I took my older granddaughter (now 15) on her first flight when she was 8, and it was so much fun to see her excitement. I did have the long car trips with babies and young children, which were challenging at times. Now there are the portable and in-car DVD players to entertain children all the way to Grandma's house. Deb, I hope you find plenty more excuses to post pictures of Wren. She's adorable! I usually fly alone. On one trip, a flight attendant asked if I would mind if an unattended child sat with me. Her original seat mate apparently was upset about sitting with a child. I had such a nice time with that child! It was her first flight and she was scared. She was nine years old and on the way to visit her dad. I told her everything I like about flying and explained about the turbulence whenever it happened. When we landed she exclaimed " that was lots of fun!" I think parents have enough to worry about with all the supplies that babies and young children require!! What would be in the goody bag? Candy?? Very odd. So, I vote no. I traveled a lot with my kids, often alone -- both driving and flying. A memorable trip was one from DC to Portland ME when I had a year old and an almost three, and I was pregnant. I got to use one of those handy barf bags as we descended into Portland. The flight attendants were wonderful. These days, my grandchildren have built-in video screens in the minivan! Denise Ann, yes! So far no video screens in our family. Bring books.